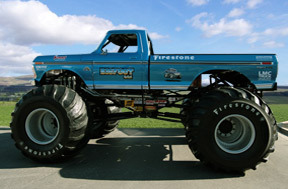 Monster Truck and Race Car Bodies now available, call us at 863-665-0300 to learn more information. Bodies are manufactured from extremely complex molds. Retro BIGFOOT We have completed the new body for BIGFOOT #12, "73-79 fiberglass drag pack #FFT-69P" The truck was completed by the guys at BigFoot 4x4 just in time to show off at the SEMA show in Las Vegas, NV. Race Truck Body Parts Drag Racing - Pulling - Monster - Mud Bogging . Please call & talk to a tech when ordering. They can help you choose the right parts. Front Ends available for many vehicles! Order Now and get a head start on this years race and show season. Steel Hoods are heavily discounted and with our new flat rate deal most hood can ship to your door for under $100 whether you are in Oregon or Miami. More Info. WOW! 130 New hoods for 2012 ! We are adding to our powerful line of muscle car hoods by retrofitting these classics with new designs such as the SRT, Stinger, Hemi, and 4.5" Dominator. 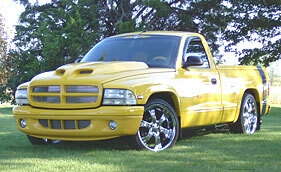 Also see our line up of late model ram air hoods. Like Us on Facebook for Sales Offers. Call 863-665-0300 and Mention this Deal to redeem. 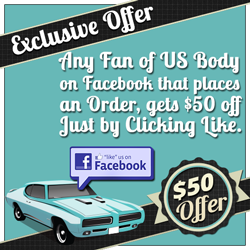 $50 Off in December, all you have to do is Like us on Facebook. Visit US Body on Facebook. You've come to the right place. Family owned and operated for over 20 years, we are US Body Source! While others are outsourcing the manufacturing of their product to other countries, you can rely on the fact that US Body Source fiberglass products have always been manufactured in the United States, using the same high standards since day one. Since 1987 we have done our best to provide automotive enthusiasts with exclusive, custom, composite body panels. So, whether your vehicle is used for street, strip or just cruising around town, we have the parts to keep you light and rust free.